Driving to Ellsworth from Blue Hill, we pass through the little village of Surry, with a few nice stops. A casual observer might think that the short half mile stretch through the village is all there is. However, if you take a little meander, you will discover some excellent roads with some of the best kept secrets in the area. 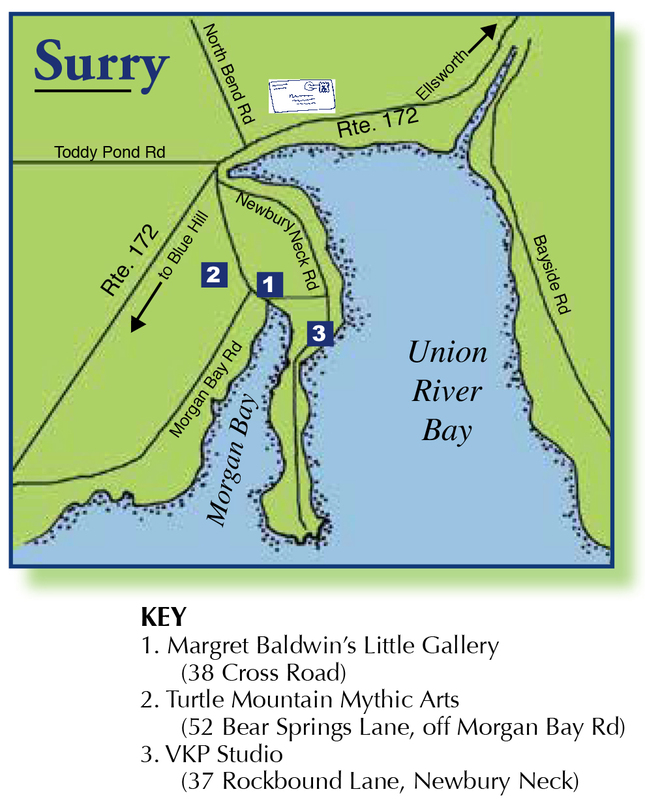 Continuing further along Morgan Bay Road, you will come to Margret Baldwin’s Little Gallery on the Cross Road to Newbury Neck. Margret has created a sweet little space to show her paintings as well as the work of some other local artists and craftspeople. While you are in the area, note the Surry Concert Barn. The barn has a long history as a local events venue, including the original home to Surry Opera for over 15 years. Alan Wittenberg has carried it forward into a marvelous venue for concerts, theater, visual arts, children’s programs, and discussions on a variety of timely topics. Follow the Cross Road to Newbury Neck Road, and watch for VKP Studio, located on Rockbound Lane and offering porcelain tableware, lamps, and tiles. Call first though – Vivian is only open by appointment this summer! Click to view a larger version..
Back on Rte 172, as you continue on to Ellsworth, take some time to check out Sweet Pea Gardens for gifts, garden items, and more. Right next door, the Flour Shop bakery offers delectable treats everyone will love! Surry Gardens is located on the right – with every imaginable plant you could want for your garden or patio, house plants, and so much more. Don’t miss a stop at Blue Moon Images, on the right just outside of Surry village. 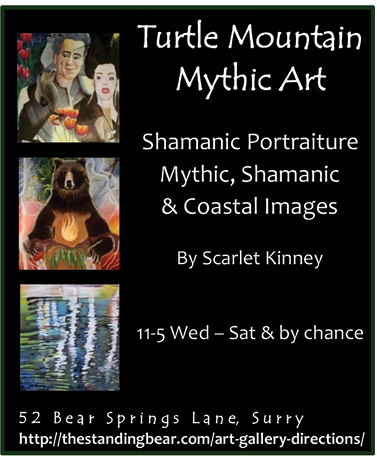 Photography, paintings, and other wonderful items fill the space. They also do great framing if you need it. Take some time to explore this little town. We think you will agree that Surry is much more than a pretty place to drive through on your way to somewhere else!